At Educate Tomorrow's 10th annual gala, Virginia celebrates with Antonio Shelton, the first foster youth mentored by her sister Melanie. 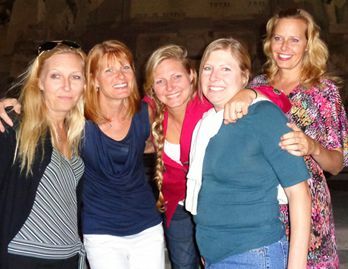 The Emmons sisters (left to right): Melissa, Lucy, Virginia, Mary and Melanie gather each year for a family reunion at the Indianapolis 500. 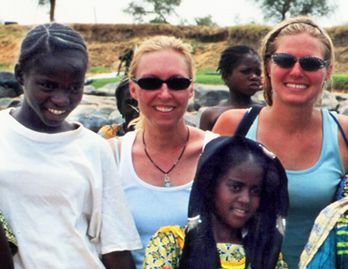 In Niger, Melissa and Virginia grew especially close to Mariama, left, who was determined to go to school. They plan to support her through college. 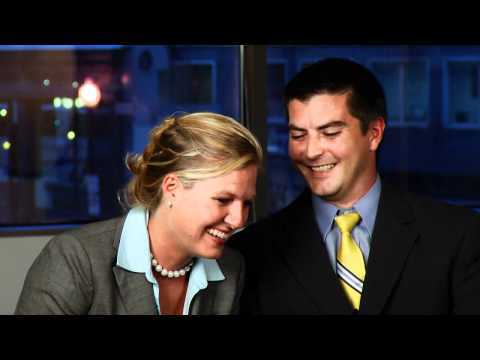 Virgina met her husband, Brett, when they were both volunteering for the Peace Corps. He became CEO of Educate Tomorrow in 2012. Virginia honors 50 Years of the Peace Corps at the White House, which selected Educate Tomorrow as a Program of Promise in 2010. The legislators at the Florida State Capitol have gotten used to seeing Virginia Emmons McNaught. For months, the founding CEO of Educate Tomorrow has been prowling the hallways, lobbying them to pass legislation that would establish a charter boarding prep school for at-risk students. Now on the last day of the 2011 session, the bill dies unless it gets passed before midnight. Although eight months pregnant, Virginia rushes to the public viewing galleries, from which she can see the proceedings and text legislators on the floor below. As the baby kicks, she places a hand on her belly and thinks back on the circumstances that led her and her siblings to advocate for education. In 1976, newborn Virginia fusses in a crib. She’s the youngest child in a family of eight children, growing up in a two-bedroom house in Greendale, WI. The Emmons are so poor that the youngest six kids – Lucy, Melanie, Melissa, Mary, Dan and Virginia – share one bedroom, while the two oldest kids – Alvin and Roy -- sleep in a utility closet, where a washer/dryer would be if they could afford those appliances. Virginia remembers not having a bed when she outgrew her crib. “Who’s going to let me sleep with them tonight?” she would ask each evening. Through difficult childhoods, with parents who have their challenges, the kids stick together for strength and support. They develop into athletes and student leaders. Lucy, the oldest sister, who becomes a teacher, sees being packed into one room as an opportunity to have nightly group therapy sessions. They remain extraordinarily close, finding time in their busy lives to travel and run marathons together. They also get together for a family reunion every year at the Indianapolis 500. As Virginia describes it, it's an opportunity to “bicker all weekend, eat fried chicken and remember our roots." Those roots include the experience of getting free lunch at school. Each Monday, before she can go to the cafeteria, little Virginia needs to stop at an office to pick up the week's worth of coupons. Due to the delay, she ends up in the back of the cafeteria line, along with a handful of other kids on government assistance -- the African-Americans bussed in under desegregation rules. By the time she gets her lunch, the table for her class is full. She and the other late arrivals sit separately at a long, empty “overflow” table. During the rest of the week, she rejoins her class table, but the other free-lunch kids always sit separately. Although only in first grade, Virginia understands how it feels to be an outsider, and it sows the seeds for her life of activism. From age 10, when she hears that one of Lucy’s friends volunteered to serve in Madagascar, Virginia plans to join the Peace Corps. In March 2000, she arrives in Kabey Fo, a tiny drought-stricken village in Niger to help with agroforestry. Though barely able to subsist, the villagers want to be educated. They ask Virginia for help, and she knows just the person to call. “Remember when you said if you won the lottery, you’d want to start a school?” Virginia says to Lucy. “Well, what if it only cost $5,000?” Lucy happens to be on a year-long child-rearing leave from the Milwaukee public school system. In just a few months, she raises funds, receives donations of supplies and gets American Airlines to ship the freight for free. When she arrives in Kabey Fo with the supplies in November 2000, she sees a one-room shack the villagers have built out of millet stalks. Since she speaks French, one of the official languages of Niger, Lucy strikes up a warm, mentoring relationship with Alhadj Amadou, a young teacher Virginia recruited from another town. A decade later, Alhadj would visit the U.S. and observe Lucy’s class in Wisconsin, as well as visit Melissa in Washington, D.C. and Virginia, Melanie and Mary in Miami. During the primary school’s first year, Virginia watches Kabey Fo come alive with the joy of learning. She wakes up to the sound of 38 children running to the school, yelling, “One-two-tree-fo-fiove.” The counting is done in their native language and French as well as English. She smiles as she overhears them running to Alhadj’s house to wake up their teacher when they don’t find him at school. Had he forgotten his responsibilities? “It’s Saturday,” Alhadj yells back from under his blanket. They run off again to practice by themselves. When they heard about Virginia and Brett's engagement, the villagers in Niger insisted on marrying them in a traditional ceremony. Meanwhile, Melanie, the second-oldest sister, is practicing law and mentoring kids in Miami. From watching Perry Mason and other TV series, Melanie always wanted to be an attorney to help victims. When she moves to Miami to attend law school, she begins volunteering as a guardian ad litem. In 1996, her first mentee, Antonio Shelton, is graduating from high school and doesn’t have the resources to go to college. Melanie finds a little known Florida law that allows foster kids to go to public colleges for free. She sets about creating a program that would inform foster kids of this opportunity and to guide them through the application process. Virginia and Brett now have two kids, Emma and Miles. The family recently attended a fundraiser for Educate Tomorrow at a Brighton store in Miami. Melissa, the middle sister, tends to take on the hardest challenges. She graduates from West Point with an engineering management degree and works in Washington, D.C. for 12 years before moving to Miami. After developing a passion for holistic health, the single mom of two is now planning to go to medical school. For Educate Tomorrow, she undertakes strategic planning, especially for education in Niger. When she first visits Virginia at Kabey Fo, she sympathizes with an awkward little girl, Mariama, who is being picked on by the other kids. Melissa and Virginia lavish special attention on Mariama, hoping to boost her confidence. She is too old, at age 7, to attend the first kindergarten class, but she is determined to learn. So Mariama sits outside every day, in the doorway, to listen to the lessons. Eventually, Alhadj relents and lets her inside. In 2006, as the first kindergarten class looks forward to graduating from the primary school, Melissa and Virginia hatch a plan for their secondary education. The closest middle school is in Kirtachi, 16 miles away. The kids have no way to commute every day, but it happens that the Peace Corps is no longer using a hostel located nearby. Melissa, Virginia and Alhadj meet with the mayor of Kirtachi to get a land grant to turn that facility into a dormitory for the Kabey Fo kids. Melissa has Mariama in mind for the dorm, so she can continue her education. Traditionally, Kabey Fo girls are married at age 14, but Melissa makes a deal with Mariama’s father. If he doesn't make her get married, Melissa will ensure that she has the opportunity to go to college. Thus far, the plan is working. Educate Tomorrow continues to support Mariama, who is now tall, poised and in high school. Meanwhile in Miami, Melanie is listening to NPR in her car one day and hears about The SEED Foundation. The nonprofit organization started a boarding prep school for at-risk students in D.C. She and Virginia begin the long hard process of working with SEED to establish another school in Miami. Getting the state legislature to pass a bill for a public charter school is the last major hurdle. Back at the last day of the 2011 session, Virginia watches anxiously as the clock ticks toward midnight. All the exhausted legislators are vying to bring their most important bills to a vote. “What’s going on?” Virginia texts the sponsor of the charter school bill after he gets confronted by an opposing legislator. He has apparently slipped the legislation in as an amendment to another bill destined for passage. Despite the opponent’s speech against it, the senate passes the bill and quickly sends it to the house. It passes at 11:58 p.m.
Relieved and ecstatic, Virginia wades through the crowded hallway to thank her supporters. Amid the hugs and kisses, she’s also on the phone, trying to convey the great news to Brett McNaught. Virginia originally meets Brett in Niger, at a Peace Corps event in 2002, but they serve on opposite ends of the country and don't have the opportunity to get to know one another. In 2006, they run into each other again at the wedding of her best girlfriend from the Peace Corps in Bradenton, FL. It’s a bit of a reunion, attended by dozens of returned Niger volunteers, including Brett, who is best Peace Corps friends with the groom. Originally from Peoria, IL, Brett is based in New York City, but, as head of construction/development for the nonprofit, buildOn, he lives for months at a time wherever he is building schools. He has come back to the U.S. for two weddings that happen to take place on consecutive weekends in Bradenton. When he and Virginia connect at the first wedding, he asks her to be his date for the second one. "Ask me when you're sober," Virginia says. He calls the next morning, and they have been together ever since. 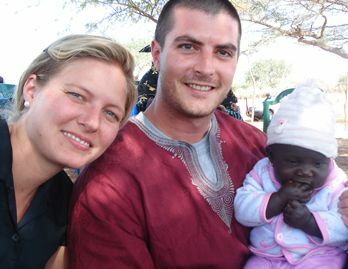 After they get engaged over the holidays in 2007, Brett leaves for a project in Senegal. When Virginia visits him, they decide to check in on her school and village in Niger. Virginia’s Kabey Fo friends are thrilled to hear of her engagement and ask, "Why not get married here?" They make wedding clothes for the couple and paint the tribe's scarification marks on Virginia's face. The ceremony consists of bride and groom occupying different huts while the elders get together to arrange their union. After that ritual is completed, the villagers deliver Brett to Virginia as her husband. Seven months later, Virginia and Brett also have a wedding ceremony in Key West, FL. In June 2011, now nine months pregnant with their first child, Virginia waits anxiously for the governor to sign the charter school bill. It’s the last possible day for his signature, or the bill is vetoed. He finally does sign it late in the day, and Virginia goes to Melanie's law office to celebrate. With this mission accomplished, she goes into labor that evening. A year and a half later, as Brett is packing for yet another building project, this time in Malawi, Virginia breaks the news that she’s pregnant with their second child. On the plane, he thinks about his responsibilities as a father and wishes he were home in a safe, stable position. He gives up his globetrotting, dream job and takes over as CEO of Educate Tomorrow in 2012. 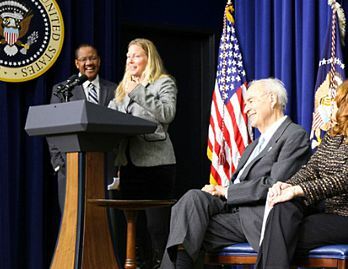 The organization has been honored at the White House as a Program of Promise during National Mentoring Month in 2010 and continues to grow and be recognized for its remarkable effectiveness. “We have 175 kids going to college this year, more than we’ve ever had,” says Virginia. In May, the Greater Miami Chamber of Commerce presented Educate Tomorrow with a NOVO Award for innovation and excellence. In July, a Miami Brighton Collectibles store selected Educate Tomorrow as the beneficiary of its annual campaign to support kids arts and education programs. 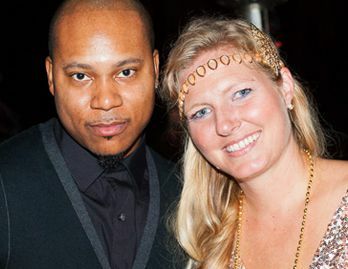 For its 10th annual gala last January, Mary caters the black-tie event with a Roaring Twenties theme. Held at a private bayfront estate in Palmetto, the party resembles a scene from The Great Gatsby. Brett and Melanie speak to the crowd about their accomplishments and hopes for the future. The Emmons sisters look stunning, mingling in the grand mansion in their long pearls and sequin flapper dresses. They’ve all come a long way since that one bedroom in Greendale.